All my life I’ve heard the expression “old and grey”, so imagine my surprise when instead of going grey, I lost most of my hair in my early thirties. But me old? No, definitely not. Because you’re not old just because you’ve stopped sleeping in tents at rock festivals. The Hilton is almost walking distance from the festival grounds, and at the hotel bar, you can always get your Jack and Coke. Definitely rock ‘n’ roll, the way I see it. And those pricey seats up front are there to give you the best view. This has nothing to do with age. Earplugs, someone says. That’s just for old folks. Nonsense I say, because you don’t want to be hard of hearing when you get old, should that ever happen. And as far as noise goes, there is no doubt in my mind that food and drink taste much better when you can dine in a tranquil environment, compared to sitting in a noisy and boisterous bar. Okay, I’ll have to admit it – I’m getting old. But old or not, I’m fascinated by the restaurant, bar and nightclub industry and their take on working environments and noise. After all, in which other workplaces would we accept such a high noise level for such an extended period? Because of my interest, I’ve looked into this and found that it’s a common belief in the trade that it should be noisy to increase guest turnover. And that this consequently drives up profits since guests consume more at the beginning of a seating than towards the end. Sounds logical, doesn’t it? But in my mind it doesn’t really make sense. Along with many other old-timers, I appreciate good wines that are often priced at a level that would send any student to the ER with alcohol poisoning if he or she attempted to guzzle beer for the same amount of money. And then we haven’t even touched on dinner, because we old guys aren’t happy with anything less than three courses. Okay you say, bars–kids–noisy. 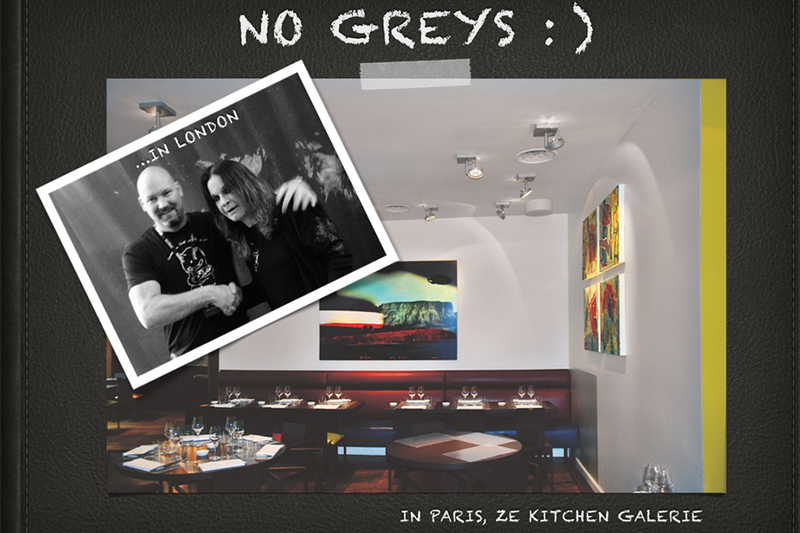 Five-star establishments–old folks–quiet as the moon. Sure, you have a point, but what about the majority of restaurants that are somewhere between these two extremes? How are their owners thinking? And how many times have you been to a restaurant that’s a bit too noisy? It feels like there are about thirteen to the dozen. I’m fully convinced that they have much to gain by dropping the noise levels in their establishments. Not just to attract the older crowd with a taste for good wine, but also to create a better working environment with happier staff and fewer people calling in sick. Now that I think about it, we old folks are the working environment’s Batman, but without the tights, since that would be counter-productive to our ends, with many guests immediately losing their appetites at the mere sight of us. So my rallying cry is clear: Old people of the world unite! For we shall now march forth and fight the good fight against noise! It’s a new year and a new semester has started. 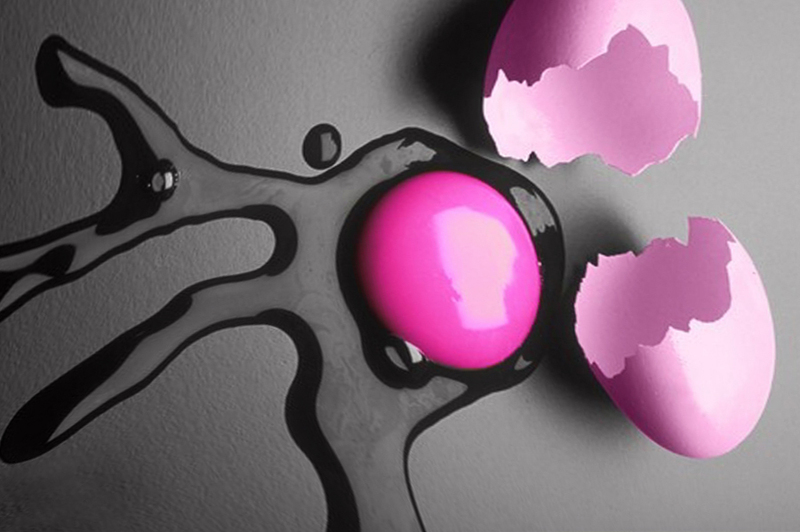 New knowledge, new ideas, new possibilities – you won’t see us, but it’s great to be part of it. 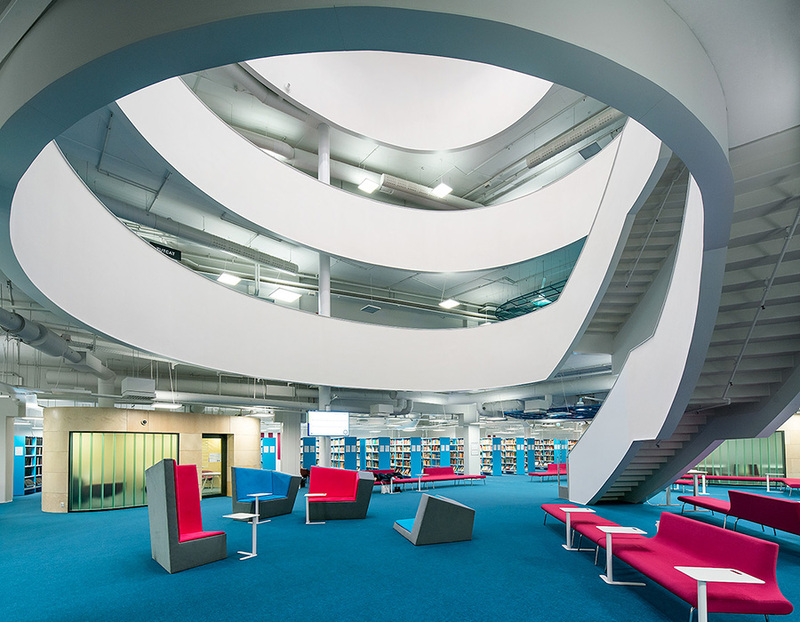 Two new inspiring schools has been built in Espoo and Tampere Finland. Prize winning Opinmäki School, Espoo, by emerging architect Esa Ruskeepää Architechts, is starting it’s second semester. It’s a property created for multiple functions. The nine building blocks of concrete and glass and angles invites different interests and ages to interact, share and learn from each other. 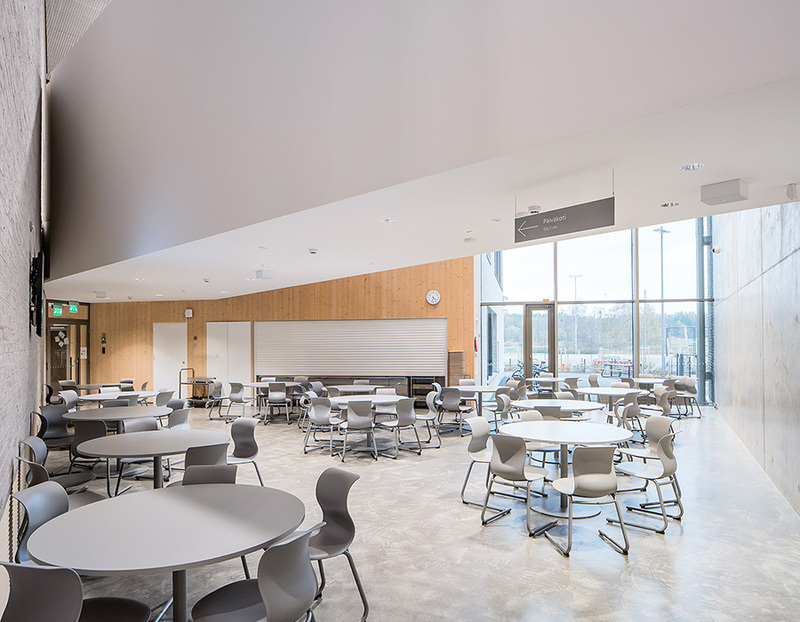 The design and set-up of some areas are attracting people to use them also after school hours, like the auditorium, sports hall and dining hall. Collaboration and cross-learning is the main concept of Kampusareena, Tampere University of Technology, as well. 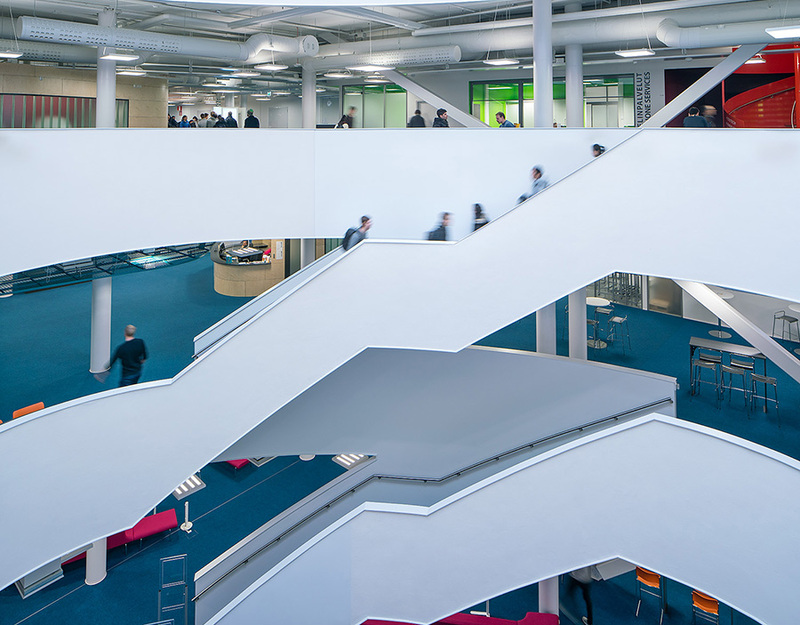 Architect, Juha Luoma, Arkkitehdit LSV, designed open workspaces, teaching facilities, meeting rooms and exhibition areas – rooms for an informal flow of communication between businesses, research teams and students. 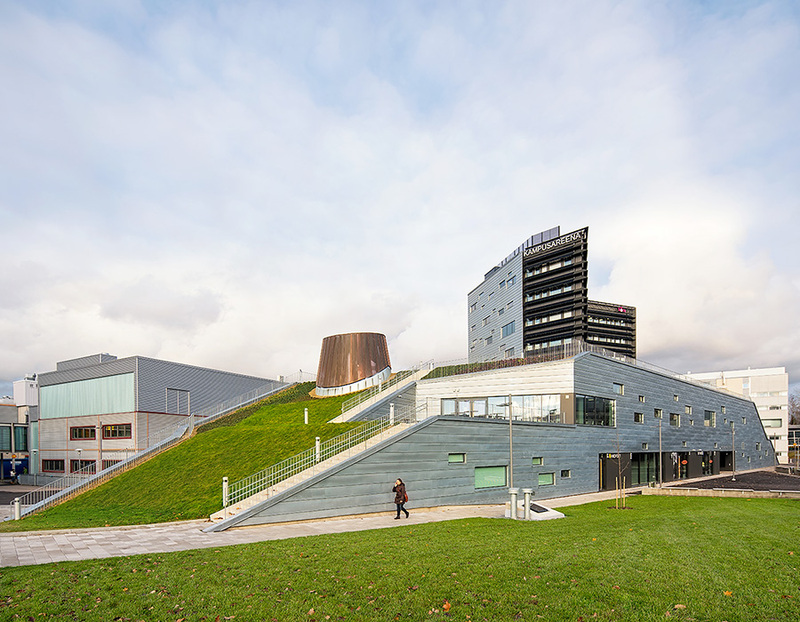 The building also incorporates ecological design principles, and has received a ‘Very Good’ rating from BREEAM. 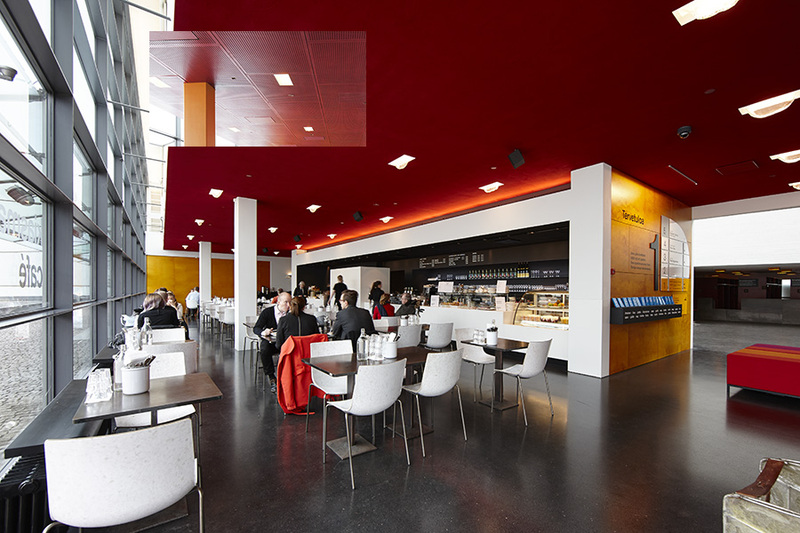 In both cases Fellert’s Even Better Sahara in white was chosen for a smooth, invisible wall solution. 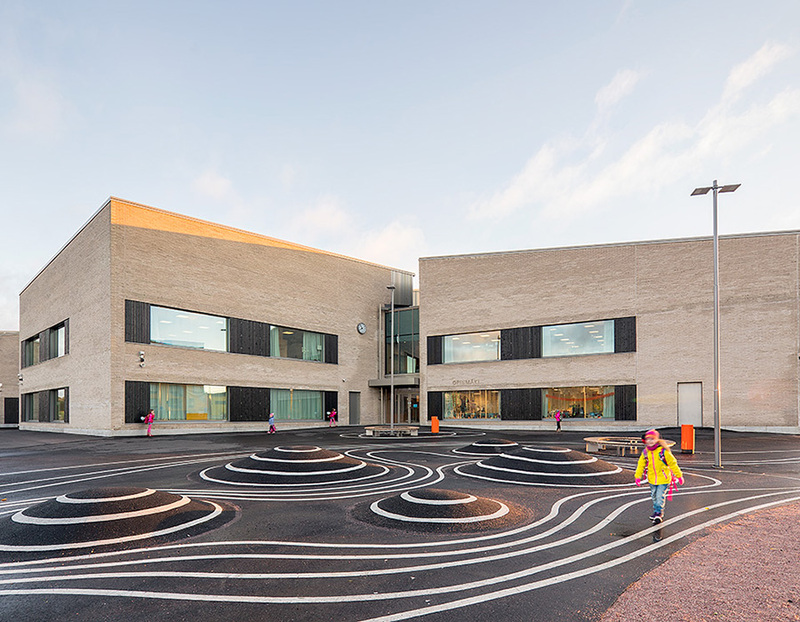 Allowing the brick and concrete walls in the dining hall at Opinmäki School to stand out and the architectural swirling lines at Kampusareena to influence the space. This is how the equation goes: good looks + great sound = even better. 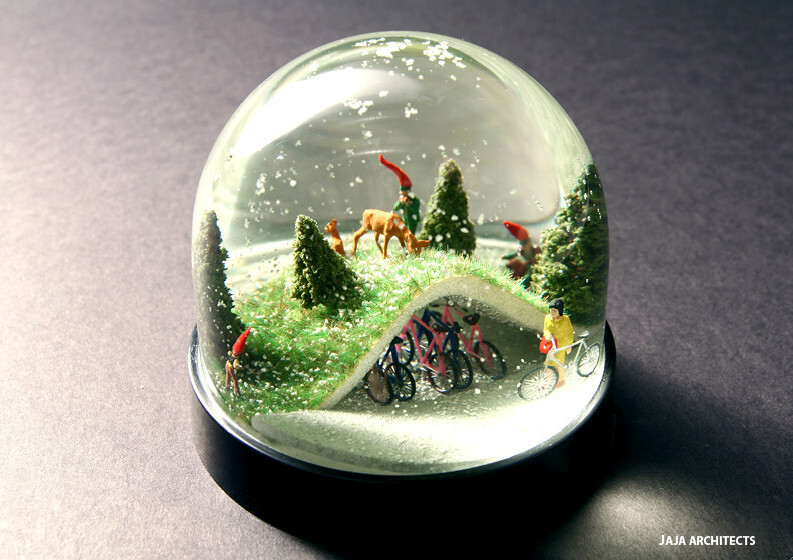 Our sincere thanks and best wishes for a white Xmas & a green and wonderful New Year 2016! The construction of Northern Europe’s biggest shopping mall and leisure destination is now complete. The building’s architectonic design was inspired by nature, the nearby Stockholm archipelago, and the four elements. 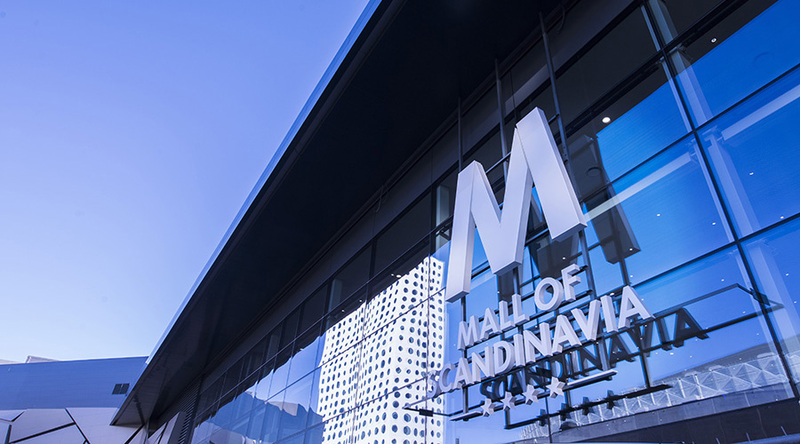 Mall of Scandinavia is certified in accordance with the environmental and sustainability standard, BREEAM, and achieved an Excellent rating for its design phase, one of the few shopping malls in Europe to do so. We supplied 13,500 m2 of Even Better Sahara, which was selected as it provides a smooth and moldable surface among the organic shapes and built-in installations. We would like to rate our installers, Montagegruppen i Malmö AB, Excellent, too. Benoy about the Promenade – We like! 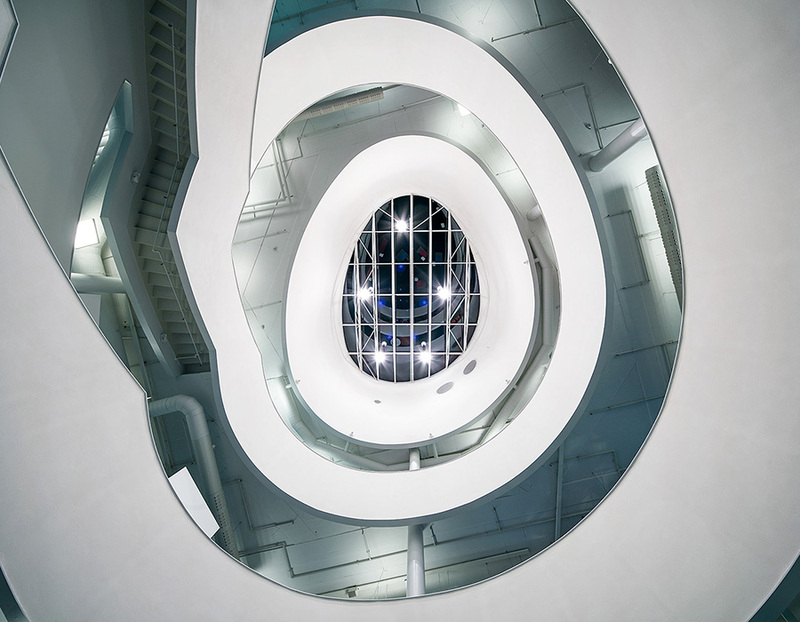 The museum of contemporary art in the heart of Helsinki recently reopened after a renovation where one of the issues was – how do we get the original Steven Holl-look and keep the acoustics at the same time? 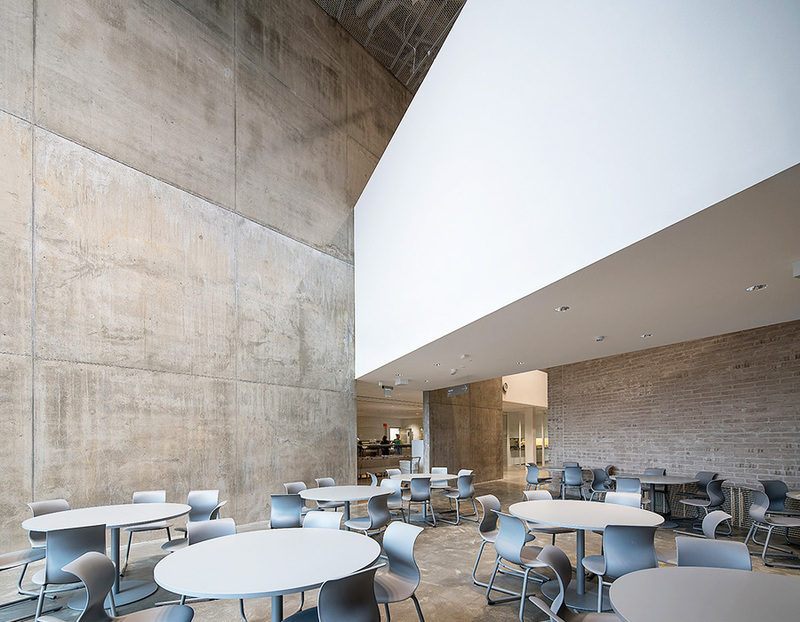 Follow the ceilings’ journey from gypsum boards and acoustical panels to Even Better sound absorbing designer ceilings. King Gustav V was the distinguished Swedish regent who took Sweden through two world wars. Besides having a stretch of road named after him where his car once skidded into a ditch, he was also known for his interest in sports and the arts. Under Gustav V’s reign a barracks building was built for six companies on the idyllic grounds of the Royal Haga Park. It is a strikingly beautiful building in the neoclassical style with two wings, 112 meters long, situated on the shore of Brunsviken. 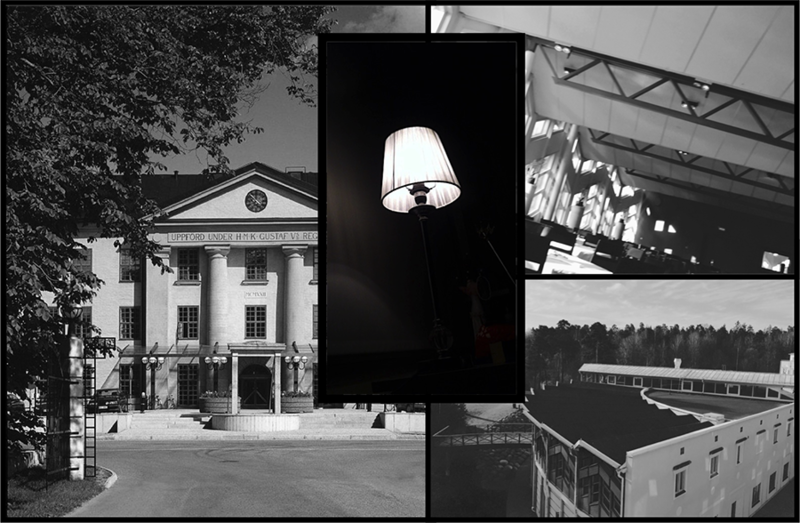 With the evolution of the Swedish military over the years, the barracks are no longer needed and the building now houses among other things, a hotel and spa. It isn’t difficult to see that the building wasn’t commissioned by just anyone. The architecture is incredible. The surroundings are as taken from A Midsummer Night’s Dream and I almost expect to run into Puck at any time as I navigate the long corridors. I even come up with a clever reply to “Human beings are to be pitied” when I realize that it was Strindberg’s Indra who delivered that classic line. As luck would have it, Puck doesn’t make an appearance. But a deer gives me a long look as I pass by a window. Whether the deer pities humans can’t be said. The atmosphere is elating. I feel inspiration and strength. With no premonition of what is soon to come, I decide that today, great deeds will be accomplished! But first a hearty breakfast. Great deeds cannot be accomplished on an empty stomach. I make my way up the stairs to the restaurant, a pavilion with expansive windows and a strikingly beautiful sawtooth ceiling. I know the view will be stunning of Brunnsviken; I’ve already checked it out from my balcony a few minutes prior. I would have a delicious omelet, but as a come up the stairs, I come to a sudden halt as if turned to stone for what feels like an eternity. My first instinct is to turn and flee, but I cannot move. What have they done with the ceiling? That beautiful sawtooth ceiling. Who? Why? I take my breakfast, but the omelet is tasteless, the coffee is weak, the juice is watery. I leave the restaurant overcome with astonishment. The image of the ceiling remains with me the rest of the day. There will be no great deeds today. It will just be another day on the job. In the evening when I lay down to sleep, the image is as tattooed on the inside of my eyelids. It won’t go away. I can’t get to sleep no matter how hard I try. With a supreme effort, I convince myself that what they’ve done is surely because they thought it would be attractive. And with the lights on, the tattooing isn’t quite as noticeable. I finally drop off to sleep. 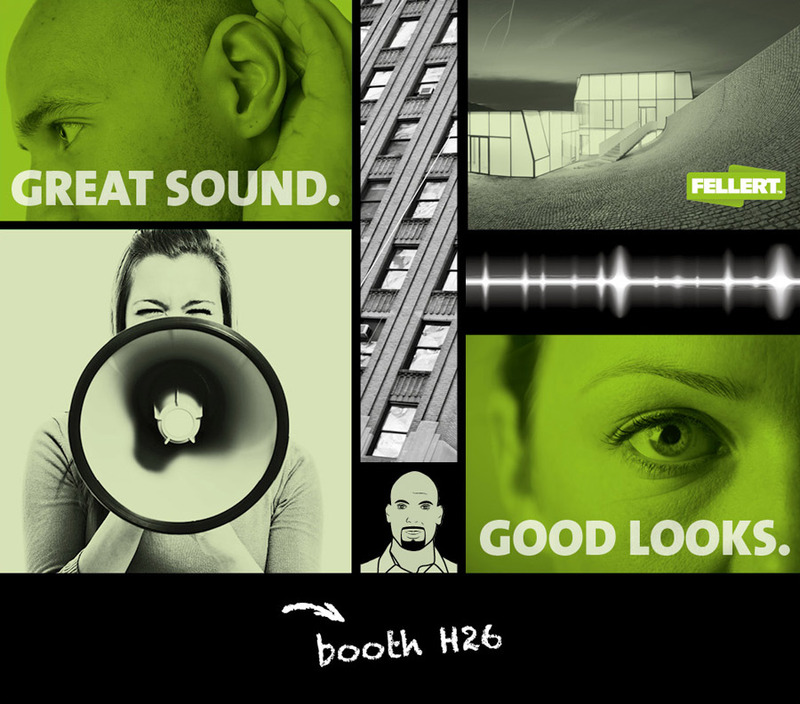 Meet us in our booth – learn how to save energy, material and resources with seamless acoustical ceilings. Build Eco Xpo Asia 2015 the global business platform for the sustainable built environment in Southeast Asia. 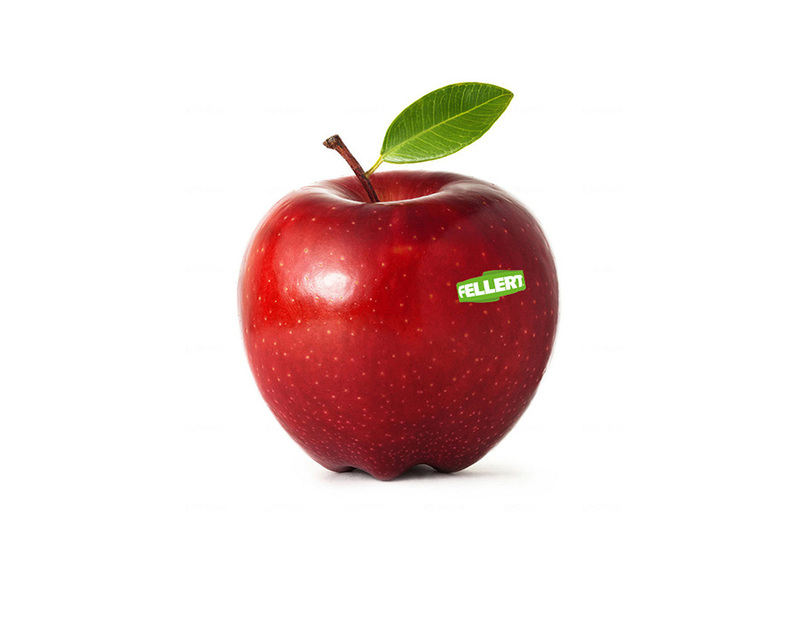 Fellert are not Jedi masters, so we simply say Great Sound, Good Looks. You’ll find us in The Promenade and JW Marriott Hotel. A shopping mall or a stage, a hotel or a spa? It’s cream-colored and it’s smooth – it’s Even Better Silk – and it creates the right backdrop to turn the space into whatever you want it to be.